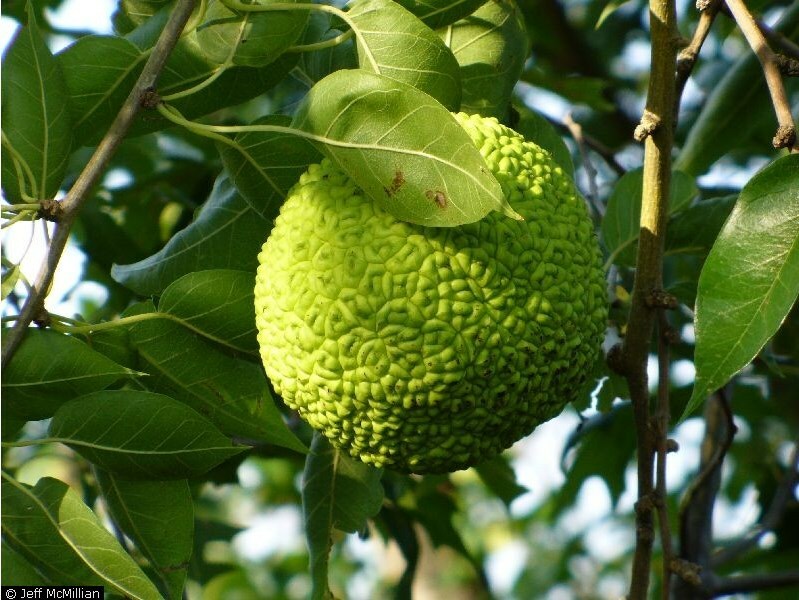 Maclura pomifera.fruit.Jeff McMillian @ USDA-NRCS PLANTS Database. (Accessed 8/2014). Maclura pomifera is a tree to 20 m; rooting deep and wide; trunk usually leaning or curved, branches low, branches curved downward, thorny when growing in sun; shaded dead branches persistent; bark brown, grooved, sap milky. Leaves alternate, narrowly egg-shaped, about 8 cm. Flowers green, 4-parted, sexes on separate plants (dioecious), males in racemes, females in round heads about 2 cm diameter, May-June, wind pollinated. Fruit fleshy, multiple, warty, each individual fruit a 1-seeded drupe, pale green, ca 10 cm diameter, aromatic when bruised, sap milky, irritating, unpollinated fruit is without seeds. Seeds need overwintering and full sun to germinate and grow. Seeds eaten by quail and squirrels martin et al. 1951). Origin: Native to TX, OK.
Habitat: Escaped from cultivation, in open areas and second growth woods, often used as windbreaks and hedgerows. Soil pH 4.5-7.5 (USDA, NRCS 2010). Shade intolerant, moderately flood and salt tolerant. Notes: Cut trunks sprout. Attacked by Verticillium wilt (Verticillium albo-atrum) and a few other fungi, as well as by several stem borers (Dorcaschema wildii and D. alternatum) and other a few other insects. Heartwood, immune to termites, yields antifungal agents as well (Burns and Honkala 1990; Sinclair et al. 1987).